The Environmental Planning Office (EPO) assists the Department of Health (DOH) with the coordination of land use project reviews. For the first time ever, DOH has been designated as the agency charged with determining the acceptability of a Chapter 343 State environmental review document. 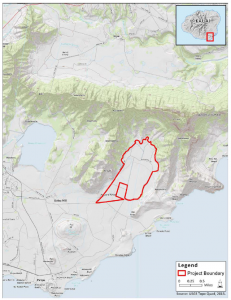 In the Final Environmental Impact Statement (FEIS) Hawaii Dairy Farms (HDF) proposes to establish and operate a rotational-grazing pasture system dairy farm on 557-acres in Māhāʻulepū Valley on the island of Kaua‘i. DOH received the FEIS from HDF on Jan. 17, 2017 and, by law, had 30 calendar days to determine the acceptability of the FEIS in accordance with Hawaii Administrative Rules (HAR) Title 11-200-23(d). On Feb. 14, 2017, DOH received a request from HDF to extend the decision-making period for the FEIS by eight calendar days. DOH allowed the extension and expected to make a decision on the FEIS on or before Feb. 24th. DOH informed the public about this extension through a DOH Press Release on Feb. 14th. DOH upon receipt of the FEIS on Jan. 17, 2017 requested OEQC to make a recommendation regarding the acceptability or non-acceptability of the statement (HRS 343-5). The OEQC complied with this request and provided DOH with a recommendation letter on Feb. 16th. On Feb. 21, 2017, HDF, through their contractor Group 70, provided OEQC with a notice of withdrawal of FEIS in accordance with HAR 11-200-23(f). On Feb. 28, 2017, DOH sent HDF and Group 70 a letter providing clarity that for this project, under these circumstances, a Second Draft Environmental Impact Statement would need to be filed. In part this is due to the addition of several substantive studies in the FEIS Appendix Volume 2. DOH feels that this new research should be made available to the public for consideration and comment. On May 3, 2017, the Fifth Circuit Court (Valenciano, J.) provided a copy of the four page order granting the plaintiff’s motion for summary judgement as to the counts I and II for the first amended complaint for declaratory, injunctive and other relief.